We will get to the deep meaning and consequences of this statement step by step. Mental capacity: the motor of your creativity also grows during your lifetime. Both dimensions, mental and motivational, grow together in a mutual influence. That is why we will conclude that a more developed management of motivation is a core matter in HR talent strategies. Motivation has been seen as the source of engagement. The usual belief is that “If you need someone to do something, he/she will be more likely to do it from engagement than from discipline”. The relationship between motivating people and their proactivity or creativity has been acknowledged implicitly although perhaps not clearly enough. This articles contribute to deepen and clarifying this link. 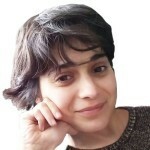 We show with some examples that Developmental Theory and our research particularly can say much more, namely: “In order to be more creative, proactive and autonomous, it is necessary to develop to a different type of motivations: from instructions or shared beliefs to recognition and congruence of personas (and company) values”. Companies need to take advantage of that. The HR and leaders talent management can be improved significantly paying attention to the type of motivation they are promoting. We will use the concept “motivational” instead of the concept used by Otto Laske, “social emotional”, in order to make it more easy to understand. We follow his work published in Measuring Hidden Dimensions I and Measuring Hidden Dimensions II in many ways, besides Robert Kegan’s work, as showed in Evolving Self and In Over our Heads. We have done several coaching sessions for creating a solid and concrete methodology. The aim of the methodology was to connect people with their highest motivation and have a clear view on the results. The steps of the final methodology are summed up in the last chapter of this article. We recorded 21 coaching sessions following the same methodology. We analyze the thoughts of the speech, following Robert Kegan (see bibliography 17, 18 and 20) and Otto Laske (21 and 22) methodology. Addressing the habitual thoughts about the “problem”, the habitual frame of reference for thinking. Creating a deep connection with one’s highest motivation (through visualization, creating something close to an altered state of consciousness). The change in the quality of thinking was clear; the second part had significant increase in the number of dialectical thoughts. The methodology and results of the research have been shared with many professionals of different fields, such as psychology, coaching, hypnoanalysis and NLP, in order to use their feedback to complete our view. Think about your evolution at work. Didn’t you find different frames for thinking in your professional evolution? Our mind is continuously growing throughout our life, both social emotional and cognitively. Thinking is everything for an executive: decisions, problems, communication, strategies… (S)he needs to improve and take advantage of this potential mental growth. We propose to go far in this mental improvement from the other side of the coin: motivation. Many times I get a direct question from the people. What is the practical application of shifting from stage 3 to 4? What are the benefits of the change in the way of feeling and thinking from S3 to S4? People lives use to get to stage 3 during the working age, and also use to remain there. In this stage, we accept social or group conventions. We learn that there are some rules that work very well for living together and getting each person interests. This way, our work is more productive and our anxiety diminishes from the law of the jungle age. This is the age of “should”. There’s something that the person or others should do, an instruction, a norm from the code of shared beliefs that rules for every situation… and so, the worker looks for that rule. Of course, those rules may be implicit or explicit. They are behind the idea of “that’s the way We do things”. So, if the person doesn’t know “the way We do things”, (s)he gets blocked. Cultural reinforcement is an important dimension that complements the norms. Many HR policies help team members share the same team or company values. If the person feels that values are congruent with beliefs and norms, team work is peaceful and productive. The warmth that common culture creates is a way of adding flexibility to the usually cold norms. While the trend years ago was to create competition among workers, a step ahead in HR has been to create good teams, or what is known as “team building”. When this environment works, people understand that sharing values, beliefs and interests lead to more satisfaction than following their own ones. They get to good team work and people are ready to abandon a selfish position. When the environment (values, norms and beliefs) is not congruent or efficient, then people don’t feel secure enough for abandoning their own interests. At the end, team development is a question of sharing written norms and beliefs of the group around values that gives a congruent atmosphere for it. But “should is good” until it doesn’t work anymore. When the S3 worker gets to a situation where there is no conventional solution for a problem or where they don’t work, (s)he sees a problem. They feel blocked unless someone helps them or the circumstances change in a way that they can use a conventional solution, rule or “should”. The worker is not proactive or autonomous anymore and the leader will have lots of extra work. In those cases, the S3 worker use to say that the situation “shouldn’t be this way” or that the other person “shouldn’t do that”… And we stop there, if we are only able to use the “should” thinking of stage 3 (S3). Hopefully, people can develop to a stage of non attachment to “should”. This is stage 4 (S4), where people don’t feel blocked in the occasions that the conventional solution fails. In case of conflict, for example, the person easily gets into reflection about the interests, emotions, limitations and understandings of each part of the conflict. In this stage, the person also has the skill to listen and explain openly in order to deepen in that reflection. In such a process, others instinctively trust in her skill and intention for solving the conflict. All this process is needed to get to the authentic agreement, a natural solution for a conflict in S4. Let’s see all this with an example. James has recently been promoted to an executive job in a financial department. His boss asked him to complete a new task: send a report every day before 8 o’clock. He underlines the importance of having an excellent report and in time for the sake of good team work. The team needs to work as a perfect mechanism. James agreed absolutely and thanked his new boss for the clarity of the instructions. But when he begins to work on it, he realizes that the information needed to prepare the report arrives at 7,45 hours. Besides, it is very complex to transfer the information in a proper way to fulfill an excellent report every day. “Oh, my God. What should I do?” James thinks. Sometimes James sends the report in a quick way for ending on time, although it does not fulfill the formal requirements. Sometimes he prepares it with all the formal requirements, but the report is sent with 10 minutes delay. He asks sometimes his team to help him, although this implies some extra work for them. They are starting to perceive James as too pushy. James is aware that this situation is stressing him, his boss and the team and decides to take a step back. He needs some deep reflection, so he decides to take distance and perspective from the situation beyond his usual way of thinking. The aim is to create new effective solutions. The values of the boss are also important for him: team and excellent work. At the same time, James guesses that they can also share the value of “team health for team improvement”. He doesn’t know how important is to receive the report at 8 and for what reason. He doesn’t know if the boss can help him to receive the information on advance from other department. He doesn’t know if the boss knows about his difficulties to prepare the report in an excellent way. James decide to prepare the strategy for a conversation with the boss. At the end of this reflection, James is ready for a solid conversation. After it, his boss agreed in having the report always at 8,15 in a new format (more simple). James understood that the conversation was more important than he thought, because his boss didn’t know about his difficulties and was feeling uncomfortable with the delays and low quality of the report. At the same time, the boss told James that he has appreciated his communication and reflective skills thanks to the conversation. “I am always observing the team in order to invite the right person to take on new responsibilities”. There is “a problem“: The executive feels that the situation shouldn’t be this way or that one person shouldn’t do that, or their solution shouldn’t fail. This frame can also be used for looking for opportunities, in case the person needs different solutions from the learnt one (going beyond the “should” solutions). He/she takes a step back and reflects into interests, emotions, limitations and understandings of each part. And even more than this, he/she reflects on the values and the deep purposes or intentions of all parts in the situation. The person finds more relevant information or becomes aware of the need of it. He/she finds a more developed frame for the conversation, with the aim of construing an agreement that takes into account all circumstances and deep intentions in a more detailed, informed and flexible way. Listens carefully in order to get the relevant information and create trust. Explains his/her point of view of the situation in a clear and authentic way. All parts reach an authentic agreement that leads everyone to a better situation. How can we apply this frame, for example, in the case of a company that is going to be acquired? (or a department). How would you see it? What would be your frame to interpret the situation? What would be the ileader nternal questions for developing the thought process in each stage? (*) SWOT: Analyses tool that focus on Strengths, Weaknesses, Opportunities and Threats of each part. What implications have this situation for me? Good or bad? What can be my position in the new situation? Who can help me? Who will be the boss? What does he like? What do I have that he needs? Who is threatening me? Who is competing with me? What is their SWOT? And mine? What can I do? What could be my strategy? What implications have this situation for my company / my team? (as I feel responsible for them). How can we keep safe? How can we keep being as we are? How can we hold on to our values in the new situation? How can we position our way of doing things? (As we are our shared beliefs and values). Adapting is ok, but at what extent? (We are an entity that needs to survive despite the absorption). What are their intentions? How do they behave? What is our SWOT? And theirs? How can we help each other? How can we defend ourselves as a team? How can we keep together? What can we become? What are their values? What are ours? How can they complement each other to create a thriving culture? How can I transmit to my team that we will need to get rid of some shared beliefs? We’ll need to change our way of doing things. What is the idea they have of themselves? What do they want to become thanks to the acquisition? What is the idea we have of ourselves? What would we like to become? How can all this be complementary or even reinforcing? What are the opportunities for Us all? How can be the communication process for creating the best we can be? Of course, a person in stage 4 will have in mind questions as shown for stage 2 and 3, but people in stage 2 will not have in mind questions as shown for stage 3 and 4. As explained in our articles about stages, the new stage integrates organically the needs of the previous ones, but from a more holistic perspective. Summing up what has been explained and shown in these examples, we are speaking about talent evolution in terms of real creativity, proactivity and autonomy. It is boosted from focusing on own and other values apart from team/company shared values, including them. This means an evolution in the source of motivation to a more pure and powerful one… A gasoline of maximum quality. A new capacity of thinking. The higher motivation not only leads to really wanting to follow company’s goals, but improving exponentially the quality of decision making, problem analyses, creative solutions and communication skills: a complete set of benefits for a new stage of talent management. The coaching 4 evolutions research demonstrates that a higher level of motivation leads to a mind frame that unleashes the possibilities of our thinking. 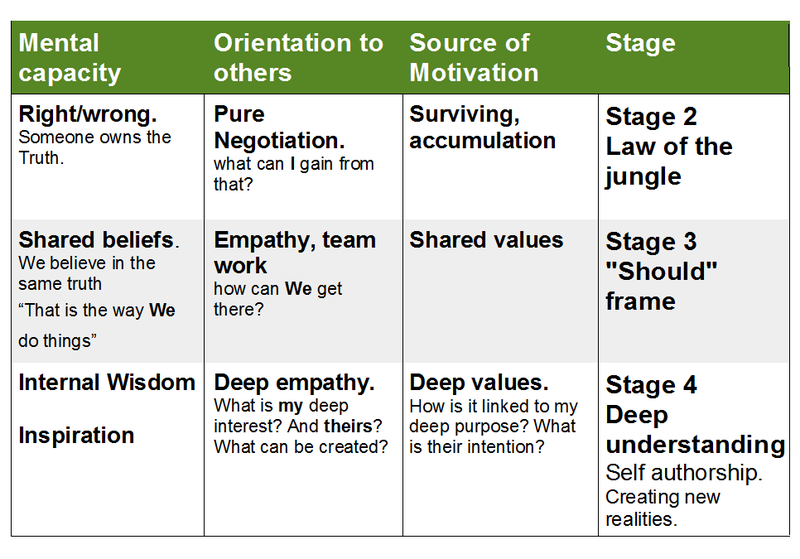 In the example, James could only get to the new emotional awareness and solution thanks to a tool that connects him to his own values and others’ values. From there, he could achieve a deeper understanding of himself and other people. This social-emotional process involves a new capacity to think. James can use abstract terms like values as the basis for new S4 solutions. This capacity of abstraction comes with the emotional awareness of our own and others intention. That is why James was able to produce the new frame of interpretation. This is what is called dialectical thinking (Otto Laske) or fourth order thinking (Robert Kegan), that come besides the motivation based on self values, in a mutual interaction. This is a jump in our life evolution and we need some technology for beginning this new way. The more neutral way for implementing it is the technology of coaching, which is even more powerful if we use the Developmental Theory as we do in Coaching 4 Evolutions. We have made 40 interviews (coaching sessions), from which 21 passed all the technical requirements for the research (recorded and transcribed and with the same methodology of coaching, as explained in the research). When someone in a “should” situation (thinking from stage 3) is helped to touch his own and others’ frames of values, a more developed quality of thinking arises, and consequently a more developed solution. In other words, when motivation evolves from maintaining group commitment to being congruent with self values, the quality of thinking increases significantly. The research consists of 21 perfectly made and transcribed interviews. Those interviews follow the structure of a coaching process, as the best way to probe the effect of the contact with values in the quality of thoughts. The speech of each interview was analyzed afterwards, based on the methodology of Developmental Theory (in the way studied first by Kegan and Lahey and afterwards by Otto Laske). Asking the coachee (participant in the research) to explain “the problem”, i.e. the way he/she looks at a situation difficult to handle. We have the hypothesis that the person is interpreting the situation under of a 3rd order of thinking (S3). (When this hypothesis is not met, we delete this interview from the research, i.e. we don’t include it). Helping the person visualize the “desired state”. It helps him/her connect with the value that is behind this situation. It is a habitual tool of coaching that gets the coachee into an altered state of consciousness. (If it is not possible, we delete the interview all the same). Asking the person to look again at the situation, under this new frame of the desired state. Asking what can he/she do differently. This will be the final observation of the session for the research. Were there a significant number of 4th order / dialectical thoughts? Analyses of the recordings and transcription of the session, with the mentioned Developmental Theory methodology. (A short history of this research is told in the abstract). How can we manage a talented person that doesn’t meet the company or team values? Will we help her to develop from her own values anyway? The worker needs to feel congruent with team and company culture and values. Also with common norms and beliefs. People need to perceive that their basic interests are satisfied. If not, workers will not feel secure for their self personal and professional development or it will not be oriented as the company would need. This was already said in the 60’s by Abraham Maslow in his splendid book “Towards a psychology of being”, and it is the same from the Developmental Theory. Ken Wilber explains perfectly in “The Atman project” how every stage is integrated in the next more developed one. The new capacity of feeling and thinking of the person leads to a system that contains also the frames of past stages. The difference now is that those frames are much more flexible, below the new frame. The key point in the human transition from S3 to S4 is that their new and more complex “system of frames” is run by a new motor: the values of the human being. This is the source of congruency under which the person will guide her behavior. There is a final award when these conditions are met: the team and the company can take real advantage from diversity. The diverse skills, psychological tendencies, experiences or perspectives will emerge in a harmonic way and will be developed for the sake of the company. Thinking is a crucial skill for professionals today, as we have seen. There’s no good work only based in effort. Good thinking is a must for strategy, problem solving, conflicts, etc. What stops executives from getting this superior level of thinking? Self motivation has its limits, even more if executives are not used / trained / coached to get to their highest motivation. And even more if they don’t know the importance to getting there. I would like to thank you for your attention giving some reflections before ending this article for practicing all the above in your daily professional live. How much quality time do you dedicate to each cluster of aims? What are you more used to? How do you feel in each of them? What can be the results of focusing in each differently? What are the aims of your team when working? What type of workers do you need? A disciplined chess table or a proactive team? How can you help them to be so? 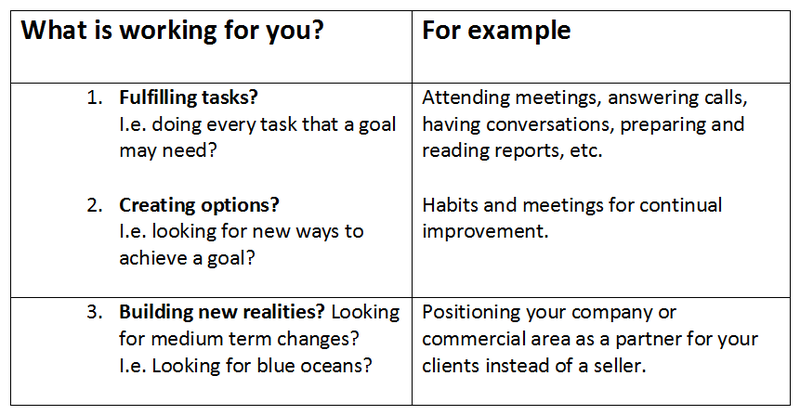 If you want responses around question 2 of the table, connect yourself or connect your collaborators with team or company values. It is the motor for the frame of thinking of “creating new options”. If you want more brilliant responses around question 2 or if you want to create a space for question 3, connect yourself or your collaborator with their own deepest values. It is the booster for the superior frames of thinking. Team and Executive coaching is being used widely as the methodology for working with values. They generate environments where people can create options and build new realities. It is the solid ground for companies whose workers are autonomous, creative and proactive. Unleash your possibilities of thinking with the technology of coaching. Get inspired. Unleash the possibilities of thinking of your teams through your listening. Inspire their higher motivation. Dilts, Robert, Changing Belief Systems with NLP, Meta Publications, Capitola, CA,1990. Dilts, Robert, Modeling With NLP, Meta Publications, Capitola, CA, 1998. Gilligan, Stephen and Dilts, Robert. The hero’s journey. 2009. Grinder, John and Bandler, Michael. The Structure of Magic II: A Book About Communication and Change. Grinder, John and Bandler, Michael. Frogs into Princes. Grinder, John and Bandler, Michael. Using Your Brain – For a Change. Jung, C. G.The Archetypes and the Collective Unconscious. 1934 – 1955. Jung, C. G. & Jaffe A. (1962).Memories, Dreams, Reflections. Kegan, Robert: In over our heads: the mental demands of modern life. Cambridge, 1994. Lahey, Lisa & Kegan, Robert; Lahey, (2001).How the way we talk can change the way we work: seven languages for transformation. San Francisco: Jossey-Bass. Lahey, Lisa; Souvaine, Emily; Kegan, Robert; Goodman, Robert & Felix Sally. A Guide to the Subject-Object Interview: Its Administration and Interpretation. Cambridge: The Subject-Object Research Group, Harvard Graduate School of Education. 1988. O’Connor, Joseph and Lages, Andrea. Coaching with NLP, How to be a master coach. Element, 2004. Rosen, Sidney. My Voice Will Go with You: The Teaching Tales of Milton H. Erickson. 1991. Wilber, Ken: Integral Spirituality. Shambala, Boston MA. 2006. Wilber, Ken. The Atman Project.A Transpersonal View of Human Development. 1996.